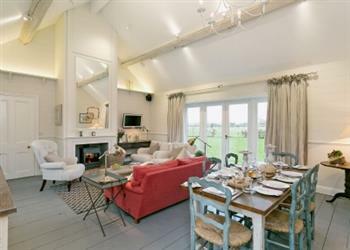 Ashbrook Cottage in Moreton Pinkney, near Banbury sleeps 6 people. Ashbrook Cottage near Banbury is beautifully surrounded by unspoilt countryside and neighbouring a small, working farm; this detached barn, with beams and a wood burner in the living room, provides superb comfort, giving you a real ‘home from home’ experience and stands adjacent to the owner’s home. With full length windows and views over the large private garden, open plan living and all on one level, this property is ideal for wheelchair access. It is located on the edge of the rural village of Moreton Pinkney and is an ideal base from which to enjoy country walks and explore the area. Relax on the patio in the evening and take in the stunning views over the Northamptonshire and Oxfordshire countryside, or walk into the village, only 700 away. Both Towcester Racecourse and Silverstone are within 10 miles and are renowned for holding world class sporting events. There are also many country houses to see, such as Sulgrave Manor, Canons Ashby House, Castle Ashby and Althorp House, the ancestral home of the late Princess Diana. Both the house and gardens are open to the public with the exhibition by the Spencer family of Princess Diana’s life and charity work. The outlet shopping centre of Bicester Village is a short drive for those who like some retail therapy and Gaydon Motor Museum, Shakespeare’s Stratford-upon-Avon, Blenheim Palace in Woodstock and the Cotwolds are within 30 minutes' drive. Oxford, with its famous university and architecture is 35 miles. The shop is 2 miles, with the pub and restaurant ½ mile from Ashbrook Cottage near Banbury. Ashbrook Cottage near Banbury is all on ground floor: Living room with French doors and wooden floor/dining room with beams and wooden floor/kitchen with beams and wooden floor. 3 bedrooms: 1 double (5ft) with en-suite shower room and toilet, 1 double (6ft, zip and link, can be twin), 1 twin. Bathroom with shower over roll top bath and toilet. Wood burner in living room (initial fuel included). Electric underfloor heating, electricity, bed linen and towels included. Travel cot. High chair. Satellite TV. DVD. Wii. Electric cooker. Microwave. Washing machine. Dishwasher. Freezer. Wi-Fi. Lawned garden with sitting-out area and furniture. Barbecue. Ample parking. Pets to be kept on a lead. No smoking. Wheelchair access. Holidays at Ashbrook Cottage run from Friday to Friday. Pets allowed at Ashbrook Cottage. For a better idea of where Ashbrook Cottage is, you can see Ashbrook Cottage on the map below. Ashbrook Cottage is in Northamptonshire; should you be on the lookout for a special offer, you can find all the special offers in Northamptonshire. It's always worth checking to see what is on offer at the moment. Do you want to holiday near Ashbrook Cottage (W44055), you can see other cottages within 25 miles of Ashbrook Cottage; have a look to find your perfect holiday location.